Singles & Pairs has called Monroe Hall home since the Plus-level club was established in 1963! 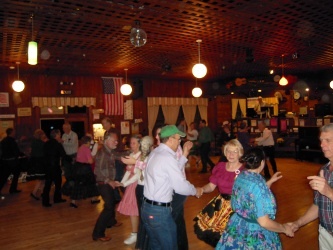 It began as a singles square dance club, and as time went on, many “singles” became “pairs”. True to our heritage, we welcome both single dancers and couples, young and old, to dance with us on Wednesday nights. We especially encourage dancers who have lost a dance partner to come and get back in the swing of things. Our caller, Lawrence Johnstone as a protege of Steve Minkin, began calling in 1994. Lawrence challenges our skills without being difficult. He tries to create smooth flowing choreography that uses called in slightly different combinations from those used by many callers.